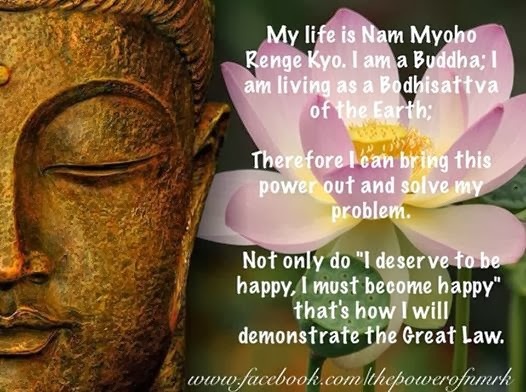 Nam Myoho Renge Kyo ~ Chant For Happiness: 1 Main Difference between Nichiren Buddhism and the "Law of Attraction"
1 Main Difference between Nichiren Buddhism and the "Law of Attraction"
The Law of Attraction says we need to focus on the positive, and what we want to bring into our lives. Yes...but...the Secret is missing any recognition of karma, and a consistent practice to elevate each person's vibration. Every day, by chanting, we elevating our life-condition. We intone the rhythm of the name of the universe itself, Nam-myoho-renge-kyo, meaning: I fuse my life with the mystic law of cause and effect through sound vibration. Let's face it, some things are easier to change than others, right? For some things you can just focus on, watch how others are accomplishing them and just make the change and make it happen. Other things, well...they could take years; they are more embedded karma, but they CAN be changed with this practice. Without the tool to tap into the source vibration itself and elevate our life condition, some of the things we want to change may never change. This is why we chant. And we receive actual proof every day that this practice works! We know that changing our karma is not easy. That's why we chant twice a day - every day! We fight to change our karma. We know that we must not just change our own karma and become happy for ourselves ~ but we also are in the daily process of helping others achieve happiness too, and spreading the word of the mystic law. If the law of attraction by itself really worked for all people, wouldn't everyone who focuses on what they want already have achieved their goals? As we know, Karma is the sum total of all our past deeds of every lifetime we have ever lived. Karma is not our FAULT, we are not bad people for having karma. We all have karma. SGI Buddhism tells us we don't have to spend lifetime after lifetime paying our karmic debt. We can change it right here, right now by chanting Nam-myoho-renge-kyo and challenging ourselves in faith, practice and study. What does this mean? It means that we get out of chanting what we put into it. The Gohonzon is a mirror of our lives. It is the vast sonic mirror that reflects the highest potential life condition, the life condition of Nichiren Daishonin, the Buddha who was predicted to be born in the Latter Day of the Law and teach us all the correct Buddhist practice for our time. After studying and researching for years, Nichiren realized that the title of Shakyamumi's highest teaching, the Lotus Sutra, was the correct practice and he began chanting Nam-myoho-renge-kyo in the 1200s in Japan. He inscribed the Gohonzon to enable people to bring out the highest state of life within each person. Even though the Gohonzon, the scroll we face when we chant, is our object of worship, we are not praying TO it. Since the Gohonzon is depicting our highest life condition, it is actually within all of us. We chant to bring forth the wisdom, the energy, the Buddhahood we ALREADY possess. When we chant we are chanting to our own life, our own essence, our own Buddha nature. We don't chant to Buddha! We chant to our own highest selves...deeper than our subconscious minds...the part of us that is connected to the whole universe. It is, of course, impossible to explain and must be experienced. If you are reading this blog and haven't experienced chanting...well, the only way to experience it is to DO it! Join us! Come to an SGI meeting. They are happening all over the world. When I first began, I chanted 5 minutes every morning and 5 minutes every evening, and I went to SGI meetings to learn more. I had a "seeking spirit" and felt I was onto something. 28 year later I am still "onto something" and live my life to help others tap into the power within themselves. When we live this way life is an incredible joy...and all our problems FUEL our happiness! To find a meeting in your area, click the SGI Portal on the right. Jamie well said... I have been practicing since Sept 2013 received my Gohonzon in Nov 2013 since then the more I chant the stronger my spirit is becoming...I look forward to chanting everyday!